This audio blog returns to the Story in Games/world building series that I was writing regarding game audio. 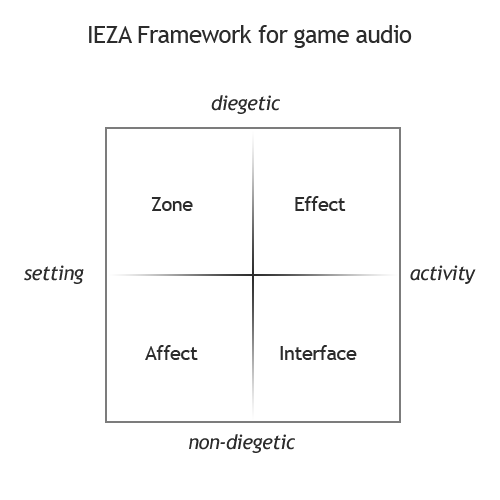 Last time I looked at the IEZA Framework and broke down Animal Crossing: New Leaf’s sound design using it. As with the first blog on music in games, this time I’m going to break down some of Monstrum into the four components, what the sounds are for, why are they used and how do they make the world that the player is in feel more believable. A really early WIP shot. Still rusty though! We also have some standard use of effect sounds like differing footstep sounds depending on the surface the player character is on or how they are actually moving. The various interactables all have relative sounds too. As well as this the use of reverb plays a big part in giving the ship a sense of space. The corridors have long, hyper-realistic reverberations that echo down its (mostly) empty halls, while the various rooms sound… roomy. On that note, we’ll jump into the Affect section. There’s a bit of a deeper reason as to the obvious difference in between the reverbs. 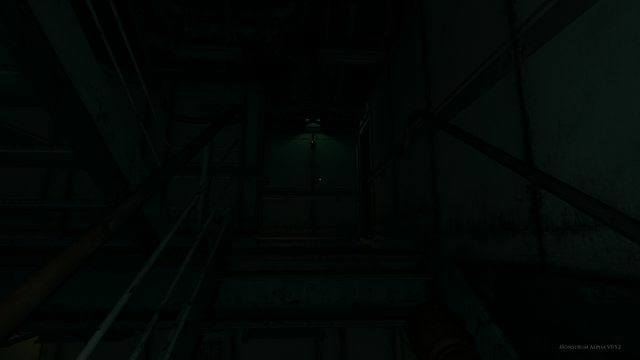 While they are being used to try and replicate the sound of the space the player character is in, the corridor’s long decay tails encapsulate the seemingly endless series of halls the player traverses through, which the rooms feel boxed in and smaller. I wanted the players to “feel” like this to a degree, especially at points when they have to deal with a monster. You’re trapped on this big, labyrinthine ship, but even within that there are microcosms, little pockets that can just as easily result in you being locked down even further. 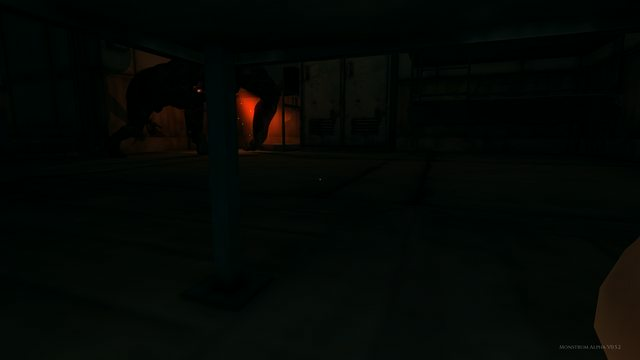 In the corridors you can run far and wide if a monster spots you. Dive into a room are your options are immediately less free, and if you chose to hide the area that the player inhabits becomes smaller still. Some times you can pick the right place too! There’s also the different themes for each monster, which has been covered in a few previous blogs. For a basic recap: each game starts with the same “wandering” music until the player is discovered. After this point the music changes to a different “bank” of songs depending on the monster in the level. There’s a “chasing” theme while being hunted, a “hiding” theme while you’re under cover but the monster is still actively chasing you down and another “wandering” theme, which replaces the original one after the initial chase and utilises some of the motifs that each respective monster has. 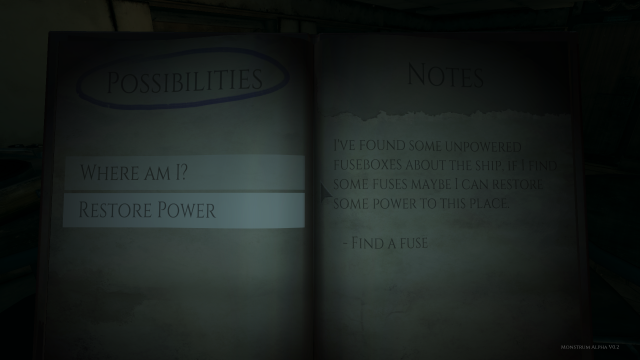 The diegetic sonic space in Monstrum is of crucial importance in multiple ways. While the Effect sounds not only provide (realistic) responses and tie heavily into the gameplay the Zone sounds define the environment, which is a fairly big part of any horror game. There is a low level base ambience across the whole ship to provide an “air”, removing the silence that could occur if nothing was playing. 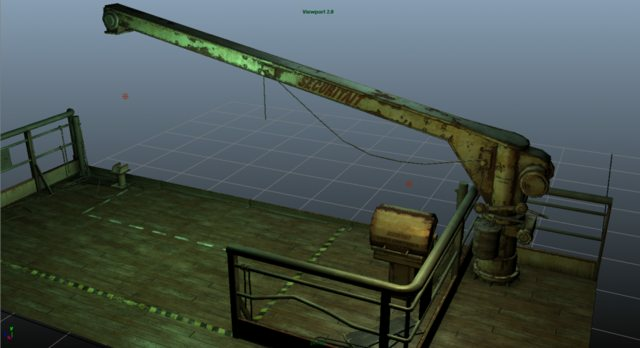 Similarly, the different parts of the ship will have their own airs on top of this to give some subtle sonic changes, in addition to the reverb changes mentioned above, as players move through each area. randomly placed sounds + random time intervals + reverb and occlusions = mysterious spooky ship noises! I’m sure Gary can go over the system in a bit more detail for a code blog on the Junkfish site. The outside of the ship doesn’t really have this effect going on as the sounds have fewer points of origin and nothing to reverberate off of, which gives it its own character. It plays more with silence, and being in the open provides a bit of a reprieve from the visually and sonically claustrophobic interior. It’s also dark. Really dark. But of course, how the audio is implemented is only part of the battle, how it sounds is also a key factor. This is quite relevant to the Hunter as it is, at times, part of the environment too. But that doesn’t exclude the others from this! We want to keep players on their toes, even before they know what they’re up against. Was that thud in the distance a footstep or just the ship? Was that noise above you just water in pipes or something creeping through the vents? Well, you’ll find out when you play the game! There is a lot more in the game that I’ve not covered, such as the radios and other spoilerish stuff, but hopefully this will give you an insight into the general audio direction in Monstrum on the whole!